Posted on June 14, 2016 . 15 Comments. Note: In my last article, How to Intelligently Define, Determine, and Test Your 1RM, I promised to follow up with a more advanced variation of The 5TRM Back Squat Program, based on the 1TRM and with a volume progression that recalls that of the Plan Strong methodology. Well, here it is. Although it has been designed for the back squat, the following program is suitable to most of the squat and press variations (front squat, Zercher squat, barbell military press, bench press). You can also use it for pull-ups, as long as your 75%1TRM is equal to or more than your bodyweight. 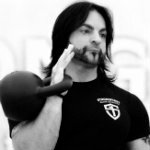 With regards to the kettlebell military press, this program is suitable if you have at your disposal kettlebells of sizes that match 75%1TRM±5%, 85%1TRM± 5%, and, of course, your 1TRM. For instance, let’s say your 1TRM in the military press is 36kg. You will need a 28kg, 32kg, and 36kg. 28kg equates to 79%1TRM and 32kg to 89%1TRM. When the program calls for a set with 75%1TRM, you will use the 28kg bell, and when it calls for sets with 85%1TRM and 90%1TRM, you will use the 32kg bell. Finally, when the program calls for a set with 95%1TRM, you will use a 36kg bell. In order to begin the plan, you need to know your 1TRM on the lift you are targeting and calculate its 75%, 85%, 90%, and 95%. Once you’ve done that, you are ready to go. Now that all the guidelines have been laid out, it’s time to take a look at the program. First of all, let’s analyze the parameter of volume (NL or “number of lifts.”) and its progression. If you take a look at the weekly NL column in Table #1, you will see the volume gradually increases for the first three weeks, and drops on week 4. It increases again on weeks 5 and 6, and then gradually decreases in weeks 7 and 8. So the volume peaks on week 6 and tapers on the following weeks, as you approach the new 1RM test on week 9. Note that on week 9 you will test you 1RM, not your 1TRM (please refer to my classification of PR, 1RM, and 1TRM in my article How to Intelligently Define, Determine, and Test Your 1RM). The total monthly volume is 200NL (30+56+70+44) in month one (weeks 1-4) and 240NL (67+84+53+36) in month two (weeks 5-8). So the volume increases by 20% from month one to month two. The volume, whether it is increasing or decreasing, changes by at least 20% from week to week. The weekly percentages of total volume are recurrent in both months, although they occur in a different order: 15%, 22%, 28%, 35%. 15, 22, 28, and 35 are “magic numbers” that are used in several different combinations and are a staple of many winning Soviet strength programs. They are used to ensure one of the main components in the effectiveness of these Soviet programs: variability. No matter in which order these four numbers are aligned, there’s always a difference of at least 20% between adjacent numbers. Therefore, when used to calculate the weekly share of the monthly volume, they guarantee a volume variability of at least 20% from week to week. The different combinations of these numbers are called variants. There are 24 possible variants, even if only sixteen are generally used for waving volume. If you want to learn more about the four magic numbers, volume variants, and how both are used in Soviet strength programming, the best way to do so is to attend a Plan Strong Seminar with Pavel. 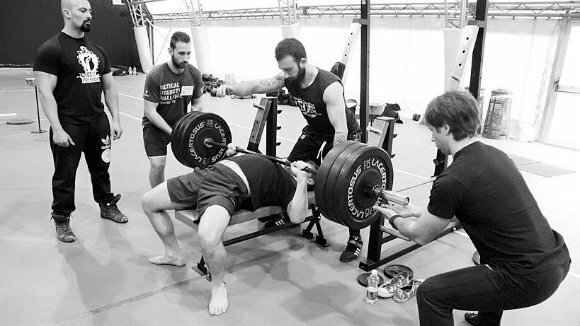 Most Western strength programs are characterized by a linear progression of volume and intensity, and these parameters are usually tied together by an inverse relationship. This means, Western programs typically start with a fairly high volume and low intensity, and progress through a decrease of volume accompanied by an increase of intensity. 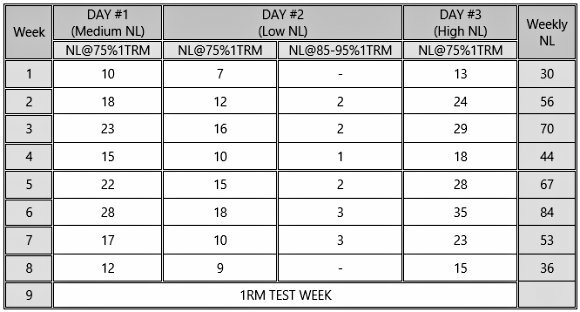 For example, an athlete one week does a total of 25NL with 75%1RM and the following week does 10NL with 80%1RM. One of the key differences between Western and Soviet programs is that the inverse relationship between volume and intensity doesn’t happen in the Soviet programs. In fact, in Soviet programs, the average intensity generally fluctuates around 70%1RM±3% of 1RM throughout the entire cycle. This doesn’t mean heavy lifts are never prescribed, but simply that most of the lifts are performed in the 65-85%1RM range. When heavy lifts (>90%1RM) are planned, they don’t necessarily have an obvious relationship to the change in volume. Sometimes the volume drops down when intensity goes up, and sometimes it does the opposite. Another key difference between the two methodologies is that in Soviet programs the change in volume is not linear, but waves from week to week. This is because Soviet scientists discovered that waving both volume and intensity leads to better recovery and greater strength gains. In Soviet cycles, the difference in the NL between two adjacent weeks is usually ≥20%, and here is where the previously mentioned four magic numbers come into play. 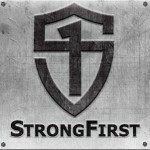 To discover more about this topic, I suggest that you read this excellent article by Craig Marker, SFG II, SFL, SFB, and COO of StrongFirst. As it was with the four magic numbers and the volume variability from week to week, the above percentages ensure there is enough variability of volume among the sessions within a week. Remember: volume variability is one of the keys to the success of the Soviet strength programming methodology. In the tables below you’ll find the breakdown of the program into weeks, sessions, sets, and reps. Once you know your training weights, you can use the tables as your training journal. To do so, just perform the number of reps prescribed in the cells related to the week and session at which you are, and then mark them as done. Easy! As it was in the 5TRM Back Squat Program, the daily NL is broken down into rep ladders of 2, 3, and 5 reps. For instance, if the daily NL is 10, it is broken down into the following three sets: 2, 3, 5. If the daily NL cannot be reached with the 2, 3, 5 rep ladder scheme, the number of reps of the last set(s) will vary from 2 to 5 in order to total the planned NL. For example, on week 2-day 1 of the chart below, the NL is 18, so it is broken up into the following six sets: 2, 3, 5, 2, 3, 3. All sets are to be executed with 75%1TRM, except on low volume days, where some singles with a heavier weight (85%-95%1TRM) are inserted between sets of the rep ladder. This means that on day #2 of any week, whenever you encounter the instructions 1@85%, 1@90%, or 1@95%, you will perform, respectively, a single with 85%, 90%, or 95% of 1TRM. Practice only twice, let’s say Monday and Wednesday or Tuesday and Thursday. Day #1: Perform 3 sets of 3 reps with 75%1TRM. Rest at least three minutes between sets. Day #2: Perform 3 reps with 75%1TRM. Then a single with 85%1TRM. Then a single with 95%1TRM. Rest at least three minutes between each set. After the single with 95%1TRM rest for at least five minutes, and then test your 1RM. Arianna Zaccagnini, SFG II, Iron Maiden, added 11kg to her back squat, taking it from 94 to 105kg, for an increase of over 12%. Matteo Brunetti, SFG II, added 12.5kg to his back squat, taking it from 160 to 172.5kg (+8%) and added 10kg to his bench press, going from 100 to 110kg (+10%). Serena Fabi, SFG I, was able to perform two reps of kettlebell military press with a 24kg bell, which was her previous PR. I look forward to reading about your results! A brilliant program. Love it! Can you do any accesory with this program? can I use this program for KB double press as well? HI Fabio.My objective was double military press with 28 kg bell, I did same 32 one hand press but never more than 24 kg for doubles. I gave a try to the program sandwiched between GS Sessiond, I use 20 and 24 kg and 26. Can, or should, women train at higher percentages? I would not change percentage. But add some acessory work instead. Maybe some triceps work for pressing. Knee stability (1leg DL, split squats) for squats. And some rowing for Pull up. If you train a lift to the end of week 9 can you then (after a de-load week) start at week 1 again training the same lift using your new 1RM to reset the weight you use or would it be better to move on to something different for a few weeks before coming back to this or follow DDM’s suggestion. I’m wondering if DDM’s suggested use of your template would be good for training for the beast challenge. I guess he doest want to reply, so much for discussion. I’m curious about how this fits into a strength program. If I used this as a squat cycle, is it appropriate to include other movements after squatting, or is squatting the only thing that should be done? I’ve been re-working the olympic lifts back into my life for the past few months and would want to maintain them for things like technique and keeping my wrists in shape for them. I was wondering if anyone had any thought about using this for the bent press. Would this be an appropriate program? When I practice the BtP I usually use singles or doubles which I believe is the best way to practice this lift. So if I did use this program would I just use it as it is, increase the number of sets to achieve the required NL with singles, doubles and maybe some triples, or decrease the NL but keep the ratios the same so I’m doing a similar number of sets on any given day? Would you recommend using this plan on multiple lifts at the same time? If not and I use this plan for my press only how would recommend performing other lifts (deadlift, squat, rows) while on this plan? Thank you. Anyone with a 5rep @ beast strength in pullups that has tried this? In regards to other lifts, can you carry on otherlifts ofr other body parts? Yes, I personally ran the program on multiple lifts at the same time, and so did some of my athletes. You must well tolerate high volume training though. I was thinking of running it one lift at a time to improve a weak lift and just do 2 sets of 5 for my other lifts. It would be interesting to rotate every 9 weeks to a different lift.